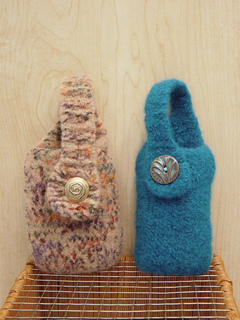 This small cell phone pouch can either snap around a purse handle or belt loop for easy access. The pouch is knit in the round on two double pointed needles and is quick and easy to knit (approx 1 hour). It can be embellished with beads or needle felting, if desired. Designed by Linda Mariska, pattern written by Linda Taylor.